Classic international target lines combined with the .40 caliber cartridge make this GLOCK a winner. 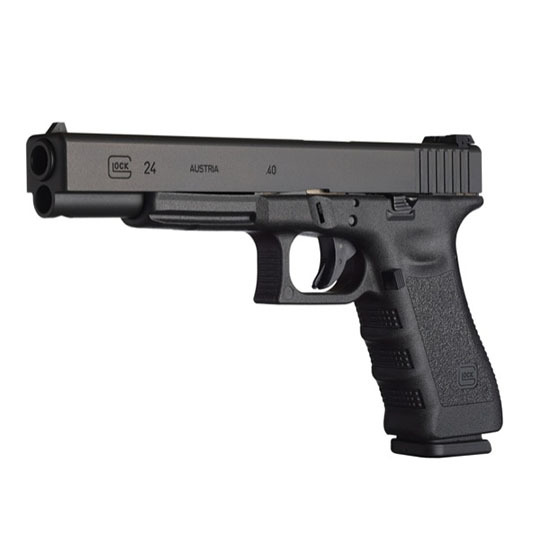 With a 6.02 inch barrel and an extended sight radius the GLOCK 24 has participated in a multitude of shooting activities including uniformed duty use. With either a solid or ported barrel it's a great choice for all users. Width: 30 mm / 8.85 in. Length Between Sights: 205 mm / 8.07 in. Height: 138 mm / 5.43 in. Barrel Length: 153 mm / 6.02 in. Weights: Unloaded: 757 g / 26.70 oz. Loaded: 1082 g / 38.16 oz.